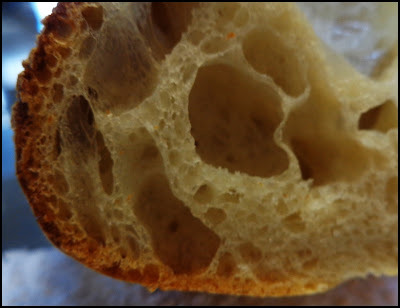 This is a continuation of this post where I listed a recipe for grissini. As I had mentioned, I am currently reviewing this book (which I highly recommend thus far) and have been testing a few of the recipes...so here's a couple more. The recipes listed below--though originally derived from the book in mention--were borrowed from BreadBasketCase (click here and here) for the simple reason that I came across them and wouldn't have to retype them (I am getting so lazy). Anyhow, both recipes are good, but the ciabatta is outstanding. That recipe I followed exactly, but the raisin-pecan bread I deviated a bit by using currants and walnuts (it's what I had on hand). I like to post recipes that are simple to make (so that people actually make them), and these may seem complicated at first glance but they actually are not. If you read through the (somewhat lengthy) directions you'll see they are pretty easy to follow. 1. BIGA. Mix the yeast, flour and water until just smooth. The biga will be stiff and dense, and may need a few more drops of water to mix entirely. Cover the bowl and plastic and leave for 12 to 16 hours at room temperature. 2. MIXING. Add all the ingredients to the mixing bowl except the biga. In a stand mixer using a dough hook, mix on low speed for 3 minutes. As the dough comes together, add the biga in chunks. The dough will be quite sticky and slack. Finish mixing on medium for 3 1/2 to4 minutes. The dough will still be sticky. 3. FERMENTATION AND FOLDING. Put the dough in a mixing bowl sprayed with baker's spray. Fold the dough twice, after one hour and again after two hours. This is where you fold quickly and assertively, adding no extra flour. 4. DIVIDING AND SHAPING. Flour the work surface copiously. Invert the dough onto the work surface and pat out the larger air bubbles. Lightly flour the top surface of the dough. Cut the dough into 3 rectangles, weighing about 18 ounces each. Gently shape into rectangles. 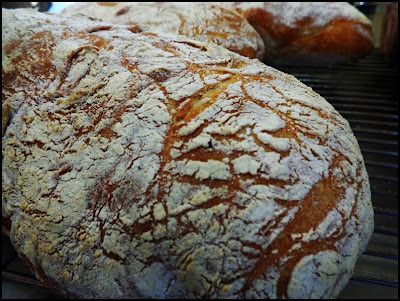 Place the dough piece onto floured bread boards (I used floured parchment paper). Cover the shaped dough with baker's linen and then plastic. 5. FINAL FERMENTATION. About 1 1/2 hours. 6. BAKING: Preheat oven to 460 degrees. To transfer the proofed dough to a baker's peel, spread the fingers of both your hands. With a quick, deft stroke, invert the dough piece so that the side that was touching the bread board is now on top. Place one hyand at each end of the dough piece, bring your fingers underneath, and pick it up. 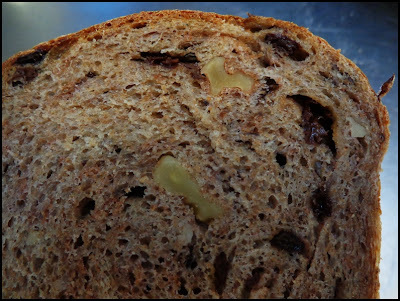 Here you will slightly punch the dough for easier transport; there should be wrinkles in the center of the loaf as the transfer it to the peel. [I just picked up the parchment paper and put it on top of a pre-heated baking stone--I'm using his instructions here just to show why I think they're hard to understand.) Fill the oven with steam, load the ciabattas, steam again, and bake for 34-38 minutes. (I used the steam machine; otherwise you can use either an ice cube or boiling water method to get steam. Hamelmans thinks you should use all three: ice cubes on a heated skillet before the bread goes in, boiling water on a heated pan when the bread goes in, and spritzing with water too). Lower the oven temperature by 10 or 20 degrees if bread is taking on too much color, but be sure not to underbake. Remove the bread from the oven and let cool on a baking rack. 1. About 30 minutes before starting, pour warm water over the golden raisins and let them sit for up to 30 minutes to soften. Drain the rains well. 2. MIXING: Add all the ingredients except the rains and pecans to mixing bowl. Mix on low speed for 3 minutes (using dough hook if you have a KitchenAid) to incorporate the ingredients thoroughly. The dough consistency should be moderately loose. Turn the mixer to the second speed and mix for about 3 minutes more. Add the drained raisins and pecans (the recipe doesn't say whether they should be chopped, so do whatever you want). Mix on low speed, just until the rains and nuts are thoroughly incorporated. 3. BULK FERMENTATION: Put in large bowl and cover with plastic wrap. Let rise for about two hours. If it's more convenient, you can put the dough in the refrigerator and let it rise overnight. 4. FOLDING: After the dough has been rising for about an hour, take it out of the bowl and put it on a lightly floured work surface, pat it out it into a rectangle, and fold it, as if you're folding a business letter, in thirds, and put back into the bowl. 5. DIVIDING AND SHAPING: The dough can be put into loaf pans or you can make it free-form into a round or oblong shape. Divide the dough into half, and place the dough pieces on a lightly floured work surface. Cover the rounds with plastic and let rest 10 to 20 minutes, until relaxed. Shape into a blunt cylinder just slightly smaller than the loaf pans if you're using the pans. Otherwise, shape into round or oblong shape. 6. SECOND RISING: Cover loaves with oiled plastic wrap or with cotton or linen towel and let rise for another 1 to 1 1/2 hour. 7. BAKING: Preheat oven to 450. If you have a baking stone, put that in the oven and preheat it too. Put the loaf pans on the preheated stone, or on the oven rack if you're not using the stone. Lower the temperature to 425 after 20 minutes. Bread baked in the loaf pans will take 30 to 35 minutes to bake. Loaves baked freeform will take about 40 minutes. This seems an interesting bread to bake over the weekend.